Last month's FLIBS show brings another sale as Ron Morgenstein at International Yacht Collection tells me that one of the most-visited yachts, the 32.9m Special Issues VIII, closed yesterday with Bob Ross at The Moorings bringing the buyer. 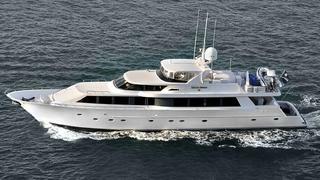 Special Issues VIII was built by Westship/Westport in 1999, designed by Jack Sarin. She has an impressive five stateroom layout, a generous 7 metre beam, and is powered by twin 1525hp MTU diesel engines with a top speed of 23 knots and a range of 2,000 nautical miles. Special Issues VIII was asking $2,495,000.